Since it’s an accident of birth, I am not the least defensive about being white. But still I say, do not put white men in charge of humanitarian enterprises unless they are democratically controlled by their intended constituents. It’s too easy for that white savior thing to rear its ugly head & they start lording it over people. What else can explain those jamokes from UNHCR advocating sending Rohingya refugees to a water-logged island in the middle of Kingdom Come? See these two spiffy dudes from UNHCR in their expensive suits? 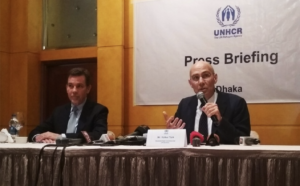 They held a press conference in Dhaka, Bangladesh yesterday to say they welcome the Bangladesh government’s “proactive steps to create an alternative settlement plan for Rohingyas.” By which they mean the concentration camps on Bhasan Char, an island which is under water most of the time & in the middle of nowhere. They did say they think it important that the relocation be on a voluntary basis. How many times & in how many ways do the Rohingya have to tell these guys that they have no intention of being sent to a living hellhole from which they cannot leave? There’s a better alternative settlement plan for those Bhasan Char barracks. Send these two guys & their other well-heeled colleagues to spend a few weeks in the place shoveling sh–t against the tide & see how they’d like it. The refugee crisis in Bangladesh is nothing to ridicule, given the miserable conditions the Rohingya are living under. But the solution is not to send them to hellholes which they cannot survive. The solution is to apply massive political pressure on the Burmese government to stop the genocide against the Rohingya people, allow them full human, democratic, & citizenship rights, & in the meanwhile demand other governments grant them asylum & traveling papers. 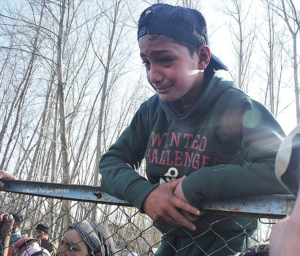 A friend of 12-year-old Atif Mir grieving at his funeral in Kashmir today. 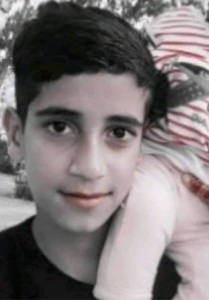 This is 12-year-old Atif Mir who was murdered today by Indian occupation forces in Hajin Bandipora, Kashmir during one of its hunt to kill operations. Clearly in Kashmir, as in Palestine, children are not accidentally harmed or killed but are the intended targets of genocide. That may be one of the tactics taught Indian troops in the training programs India contracted with Israeli paramilitary forces. There are days for all of us when the scale of the brutalization & extrajudicial executions of children overwhelm us. It makes evil seem insurmountable. As long as there are children sustaining such violence & as long as there is political resistance to it, we must stand solidly with them in building the political power to end it. May young Atif Mir Rest In Peace. Our heartfelt condolences to his family, friends, & neighbors. End the occupation. Self-determination for Kashmir. Retired US Army general Sean MacFarland says “identity politics is a cancer.” He described to his rightwing audience how it makes turning good kids into trained killers so much harder for the military. Conformity is required & God forbid a Black or Latino soldier or a woman would violate esprit de corps by objecting to mistreatment. James Comey is posturing as some sort of civil liberties hero, but as deputy attorney general under Bush he authorized torture, including wall slams & waterboarding, warrantless wiretapping, & indefinite detention. Reportedly, his wife warned him not to “become the torture guy” but he claimed he was compelled by law when in fact he was violating US & international law. 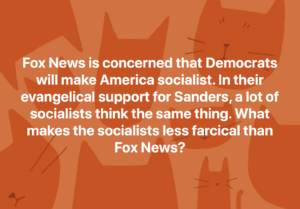 In short, he is a monster with the affable persona of a sociopath. 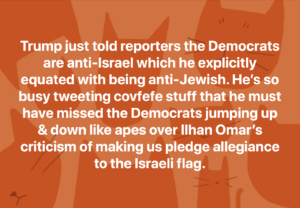 Trump called Democrats anti-Israel because six presidential candidates, including Sanders, O’Rourke, Harris, Warren, & Gillibrand, have declined invitations to the upcoming AIPAC conference which Netanyahu will address. 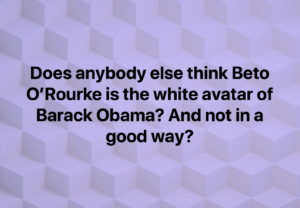 If elected, all of them will continue their support for Israel as US policy. What their snub of AIPAC represents is pandering to the growing popular disaffection & opposition to Israel for the purpose of garnering popular support. What’s important is that growing opposition which we must turn into active solidarity with Palestinians.